Imagining a beautiful outdoor space, and then realizing that vision —physically working to bring the dream to life— is one of the best parts of my work as a garden designer. I have created many private gardens, but having the opportunity to design and install a public garden —one dedicated to art and nature within my own community— has been a new experience for me. 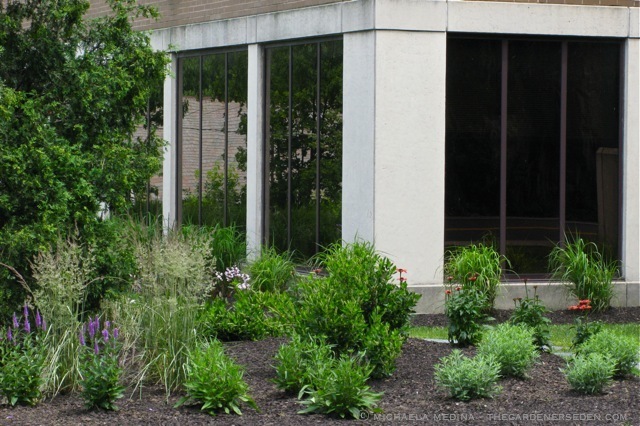 For the past two years, I have been volunteering my services as garden designer (and recently, with Turner & Renaud Landscaping Services, as garden installer as well) at the Brattleboro Museum and Art Center in Vermont. If you have been following this blog for awhile, you will recall various mentions of this long-term project. 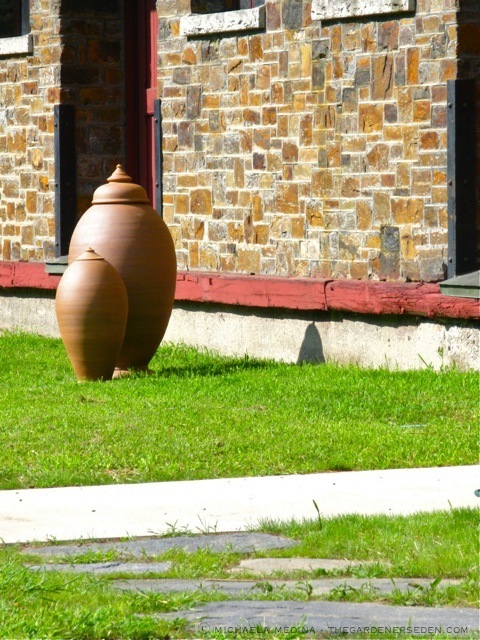 Rounding the Corner of the Sculpture Garden’s Stepping Stone Path, Stephen Procter’s Lidded Urn Catches the Late Afternoon Sunlight (Plantings include Echinacea ‘Big Sky Sundown’, Sedum and Fothergilla ‘Mt. Airy’). 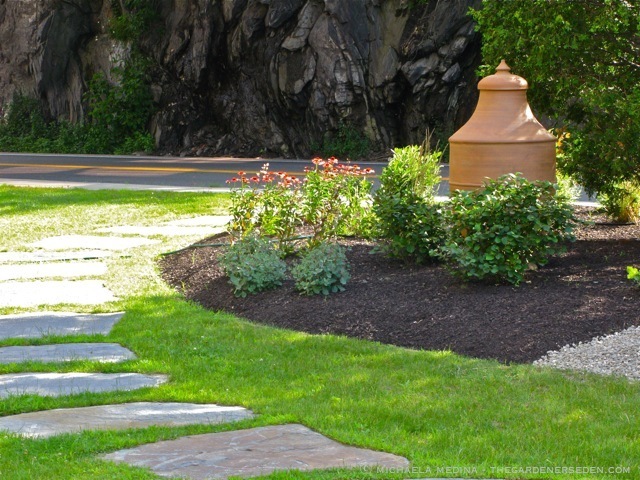 Stepping Stone Path is by Turner & Renaud Landscaping. See credits below. Garden Design and Installation at BMAC is by Michaela Medina. For inquires see my professional services page at left. 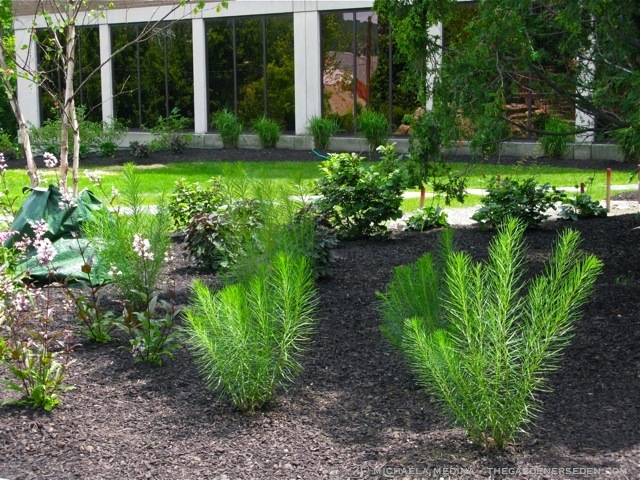 Professional Landscaping Services and Installation on this project (including hardscaping, stepping stone path, tree installation, shrub sourcing and endless details) were provided by Turner & Renaud. Special thanks to Christie Turner and her crew for their many hours of service and generous donations toward this special gift to the Brattleboro community. 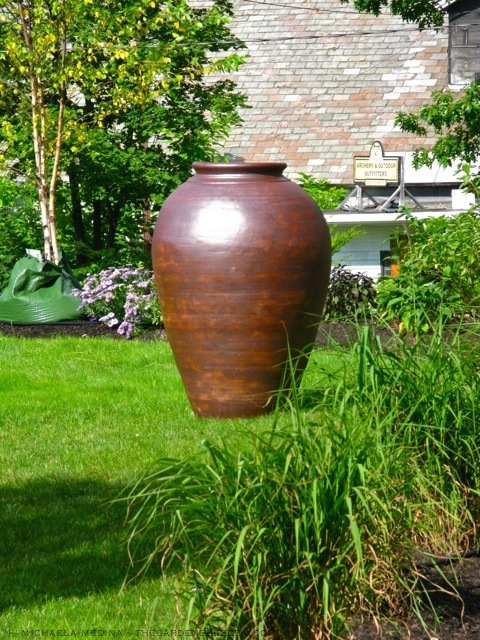 § 3 Responses to Art in the Garden: Monumental Vessels The Work of Artist Stephen Procter at Brattleboro Museum & Art Center, VT"
Got a question for you though… I know that it’s the latest “thing”, but do you find that the “black” mulch warms things up more than regular old wood chips? Sorry, I’m such a purist sometimes, but to me it just seems counterproductive when mulching is supposed to keep roots cool and reduce evaporation. @ Deb – Ah yes. You noticed the gorgeous and historic, Brattleboro train station. Although the building is now home to BMAC (check out their website, linked in the post for more photos of the building), the lower level still serves travelers with ticket sales and as a drop-off point for the train. Soon, federal money will bring up the entire depot area (and a new train station is in the works). As for Stephen Procter’s work, his site has more information. I’m not sure of where he gets his clay. I hope to pay him a studio visit when my garden design work slows down in late August/September. And finally, on the mulch. It does look blackish in the photos, doesn’t it? But actually, in reality, it’s not. The mulch is a very, very dark brown color. In all honesty, I’ve never used this mulch before. The mulch was generously donated by Turner & Renaud. They make their own and use it all the time, with great success. So far though, the plants are doing very well (in the ground near a month). The soil beneath seems both moist and cool when I check on the plantings. In my own garden, I tend to use a combination of well rotted compost/leaf mold as mulch and/or cedar bark (particularly near the house to ward off insects). I’ll be monitoring the BMAC garden closely, and will let you know if anything changes in terms of the soil conditions/plant health. Whew, that takes a load off of my mind. 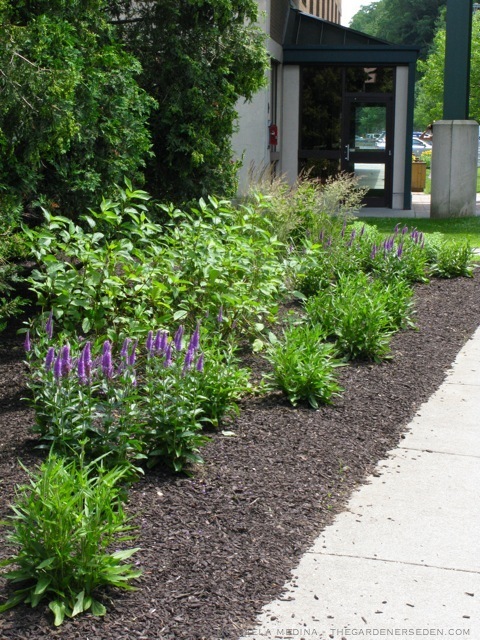 Glad to know for sure that mulching is just a great idea regardless of the colour. 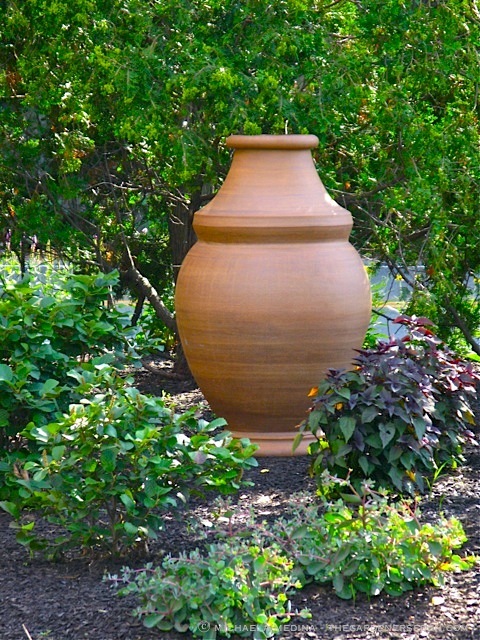 You are currently reading Art in the Garden: Monumental Vessels The Work of Artist Stephen Procter at Brattleboro Museum & Art Center, VT at The Gardener's Eden.